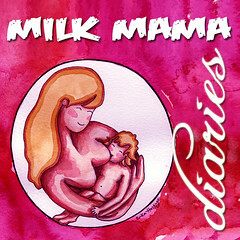 "Welcome to the Milk Mama Diaries Carnival (September). For this month, we will tackle milk sharing and how it can nurture the community, and how this spirit of giving can be sustained. Participants will share their thoughts, experiences, hopes and suggestions on the topic. Please scroll down to the end of the post to see the list of carnival entries." Milk sharing, whether through wet nursing or breast milk donation, takes the expression, "it takes a village to raise a child" to a whole new level. I had originally intended to interview a wet nurse or two from Arugaan for this... just so I can share from their perspective, but I didn't manage my time well and wasn't in a productive mood. Good thing, I can tap on recent discussions in my mommy groups for something to say. First, on the issue of wet nursing. I was among those who thought that a wet nurse should get screened and tested first to make sure she's 'clean' and 'healthy'. Sounds but practical and safe right? But there is something wrong in that thought because it is incomplete... and I thank God for Arugaan for setting me right. Families who may be in the receiving end of the services/generosity of a wet nurse do have the right to make sure the wet nurse is healthy... after all, she is going to be holding your baby and giving that baby her milk. But they cannot demand it without also ensuring that THEY are clean too... after all, they also might be passing germs or viruses on their infant, who may pass it on to the wet nurse. Trust plays a huge role here... because even after the tests (if the receiving family choose to have it done), both families would need to really safeguard their health too and be upfront about health issues for as long as the wet nursing is going on. The receiving family has an obligation to their wet nurse too, it is not a passive relationship wherein they would just take and take from the wet nurse. How many of you have thought of this? Now, breast milk donation will not require that same level of courtesy... but it does require courtesy too. In a mommy forum, some breast milk donors have felt offended and maybe even hurt that others seeking breast milk donation have been a little demanding about it. Some come off as if they're ordering pizza or something, requesting for a certain number of ounces already... and now. Since I never really pumped to store, I can just imagine how offensive that is to a mom who struggled to get her supply up... who would take time away from other meaningful work just to pump and store... and then have the heart to give her precious milk away... and that milk to be treated like some beverage being bought on a discount. If you're the one seeking donor milk, or helping loved ones to get donor milk... please, be considerate a hundred times over. Offer to replace the milk bags, pick up the milk, don't pester for the milk at odd hours, say thank you for what is given (even if it is only a few ounces) and BUILD UP YOUR SUPPLY SO YOU CAN BREASTFEED YOURSELF. Donor milk is love usually freely given away, so do not take it for granted. Do not waste it. Do not think there's an endless supply for you to just tap at will. And know that some of those who donate have been in the receiving end of help too because they struggled early on... and now, they're giving back. And it would be a poor way to repay their potential kindness by leaving them messages demanding for a freezerful of stash (even if you're paying for it). Be nice. Otherwise, you might not get milk for your precious babe. Milk sharing is a dance where both parties have to be considerate of each other's needs and feelings. And only when both are can the dance really be very rewarding. Your analogy couldn't be more apt. BM sharing is like a dance nga. Both parties should do their part to share BM responsibly. Your analogy could not be more apt. There are some unwritten rule for those involved in BM sharing that must be followed. "Milk sharing is a dance where both parties have to be considerate of each other's needs and feelings. And only when both are can the dance really be very rewarding." I think courtesy should always be there, especially if you're the one on the receiving end. Ikaw na nga nanghihingi, ikaw pa demanding. Di naman ata tama yun. Oh, well. Siguro may ibang moms lang talaga na ganun. I was on the recipient side, and I was always grateful on what the donor can share with us. I don't get why some can be so rude. Beggars can't be choosers. I agree. Those on rely on donated BM should also learn how to increase their own supply.